July | 2011 | Renowrites blog! It’s official. Borders is closing the rest of their 399 stores and will walk in the sunset just like Tower Records in 2006. I’m not suprised as I’ve always thought the brick and mortar box bookstore is a dinosaur business plan. People like to drink coffee and read books, but when they can do it all for free at a Borders or Barnes & Nobles, how do these companies survive? The thought was they would sell enough books, but Borders proves that bookselling is following the path of the music industry. Instead of mp3’s, we have ebooks and ereaders without a central hub like iTunes (as of yet). 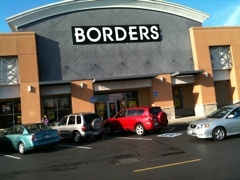 Speaking of Barnes & Nobles, what does Border’s story mean for them? I anticipate they are racking up ideas on how to keep their business alive, and I hope they focus on growing their Nook business, because ebooks is the future of bookselling, even if I still enjoy having a physical page to turn. Here’s a good article on what B&N needs to do to survive. Now I go back to the task of writing, knowing that the book publishing business continues to change with or without me. But I’m skeptical. I believe local bookstores with minimal stock will survive, and the best way for debut authors to get their work noticed is to sell significant ebooks of their work.